When mailing an envelope or postcard, leave space at the bottom of the envelope because the postal services reading/sorting machines occasionally print bar codes on your mail. Here are some instructions on how to send a „recorded delivery“, to make it easier for you. 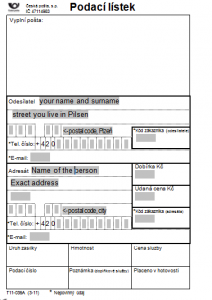 – Get a form called „Podací lístek“ (small paper, which can be found in any post office) – Fill in your name and surname, your address, and the name, surname and address of the person you are sending to (as you can see on the picture) – Go to the post office and say (or write) „Dobrý den, prosím o zaslání doporučené zásilky do…. (the country you are sending to), meaning: „Hello, I would like to send a recorded delivery to…“ Address Example: Jane Doe [recipient name] Ostrovní 320/62 [street name, block number / building number] 100 00 PRAHA 10 [postal code, city name, one to three digit numeric identifier for post office] CZECH REP. [country name] Stamps (známky(pl) známka(s)) can be bought in bulk or as you need them. If you purchase them in the post office as you need them, they will automatically weigh the letter and put the appropriate amount on the envelope depending on weight and country. Depending on the country of origin, and value of the parcel will determine the process of receiving your package in the Czech Republic. If the goods come from an European Union member state, there is no customs or clearance necessary and your parcels will continue directly to your address. Consignments from other countries will be directed to the Post Office of Exchange Prague 120, Plzeňská 139/290, Prague 5 – Košíře, and go through the customs clearance procedure. If the parcel imported has the total value (not including shipping charges or insurance) of less than €150 or if the amount of duty payable, does not exceed €10 then duty is not paid. Neither duty nor VAT is payable if the total value of the goods (not including shipping charges or insurance) does not exceed €22. If your parcel does exceed these limits, you will receive a Notice of the Arrival of Mail from Abroad. You will be asked for more details about the parcel, additionally you will be required to sign an authorization form that allows the Czech Post to act as your clearance agent. (If you do not authorize the Czech Post to act as your clearance agent, you will have to go to Post Office Prague 120, Plzeňská 290/139, Prague 5 in person to claim your parcel) Once the package has been cleared, you will be informed via post and you can pick up the parcel from the assigned post office. You will have to pay duty fees, as well as fees for the Czech post acting as your clearance agent. You can find the price list here. Unfortunately, these documents are in Czech and they can be confusing to fill out or understand. Here are examples of the forms you will receive and their purpose. Example of the Power of Attorney (plna moc) form which allows the Czech post to act as your clearance agent. Step-by-step 1. Fill out the forms above. We have provided directions in English on the form examples above to make things easier for you. 🙂 2. Scan them, and email them to sklad.praha120@cpost.cz, include number of the package in the subject line (podaci cislo, skladove cislo) and wait for confirmation via email. These numbers for the subject line can be found on the Notification of Mail from Abroad letter that is included with these two documents. Alternatively, you can send the forms via post to Česká pošta, s.p., Oddělení celní deklarace, Plzeňská 290/139, Praha 5, 220 00, but it will take more time to receive your package. If you plan on receiving packages from abroad often, you can fill out the form and send it via post to the Customs Declaration Department at Česká pošta, s.p., Oddělení celní deklarace, Plzeňská 290/139, Praha 5, 220 00, or scan it and send it by email to cd-praha120@cpost.cz and the Czech Post will have the authority as your clearance agent until otherwise revoked. If you are interested in sending parcels or letters delivery guarantee, tracking numbers, or as priority mail, you can find all the necessary information about registered mail here. For general information about services: 420 840 111 244. You can send your queries, comments, wishes or complaints via email: info@cpost.cz. Chelsea, I must thank you for writing such a much needed piece on using the Czech post offices. This is a big help to myself and many other foreigners living in CZ. I used to be afraid of using the Czech postal services because I don’t speak the language very well and didn’t know the services and postal rules but now after reading your blog I feel much more confident and prepared. Thanks again! What do I have to do?can you help me? The value of the item is 188 euros and it is a gift. I havent receive any iformation from ceska posta. Ive seen the status in track&trace but now im worried about that because im from spain and i dont know what to do. Please, How long can a parcel posted via regular airmail get to Hong Kong from Czech Republic? Thank you very much, truly, for taking the time to write all of this, its really helpful. Thanks a lot, It’s so refreshing to learn the info about Post Office in Czech Republic, In our country, bar codes are only be printed on express singles, there’s no bar codes on ordinary letters. you’re a professional in this subject. Fine with your permission allow me to seiz your RSS feed to keep updated with forthcoming post. This post was a huge help for me today. Thank you! What should I do? Please help me. 11.8.2015 The consignment was accepted by post office of exchange in the country of destination. 28.7.2015 The consignment was sent to the destination country. I went to the post office in Italská, Prague 2, to send a letter to England. I followed your instruction, and everything was great! Dobrý den, prosím o zaslání doporučené zásilky do Anglie. Prosím obálku. 2) She gave me an envelope, I paid 1 CZK. 3) She asked me to fill in the small form (podací lístek)and get back to her afterwards. 4) I filled in the podací lístek, also write the sender’s (on the left upper corner)and recipient’s (on the middle-right space)information (name, address) on the envelope. 5) Got back to her, and paid 68 CZK, and she gave me back the podací lístek with a printed information in the above space (date, fee, etc). I realized that some Czech are cold/ rude, but some are just normal people; and this might be the same everywhere. My previous visit there was not nice; it was another lady, and she was not that friendly in treating customer (I talked to her in English, and clearly she did not speak English). Thank you so much. This blog is so helpful, otherwise i lost hope :p. No one around here really speaks English or even tries to help. I”ve scanned and sent the form for Application for Future Electronic Notification of Mail from Abroad, as I have received a parcel from abroad. But my question is it necessary to fill out the Power of Attorney (plna moc) form as well and send it to the email? 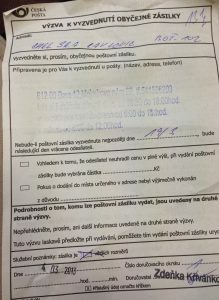 What are the consequences of not using the Czech Post to act as my clearance agent? Is ceska post served to india and Bangladesh? sent a parcel from Prague to Singapore..
“The consignment was sent to the destination country”…..
is this normal? what is the average time for Economy Shipping? 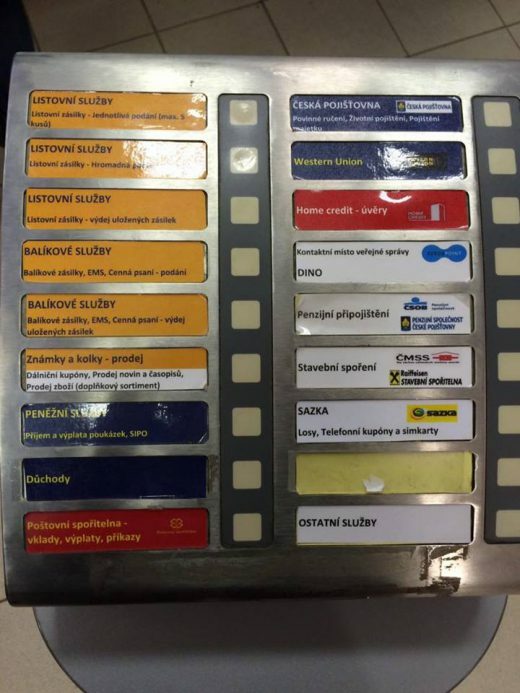 What are all the other courier services offed in CZech post office. Thank you!!!!! I have had my daughter’s birthday gift sitting in my flat for months. I have attempted to send it to her, but have left in tears- utterly, overwhelmed! I am overjoyed to have stumbled upon this wealth of information! May I have your permission to post this link on the FB -Prague Ex-Pat advice page? I KNOW the ex-Pat community would be overjoyed! How long does it usually take if our parcel is being held by customs (import) in czech? I am a student who currently living in Prague. Does somebody know if the post office can do a pick up delivery? I need to pick up a document in Belgium, and send it to Prague to my address. If somebody knows about it, I’d be much grateful.